For many years, I worked with mallets that I’d either made or purchased. I had a tendency to use them just as they were when they were first made. 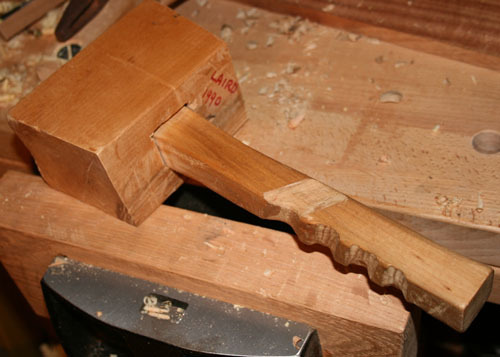 After a while, I decided I might be able to make slight alterations that would positively affect the comfort and potentially the usefulness of the mallet. One mallet I made in 1990 and used for about 5 years before the light came on. Ultimately I took the mallet and held it in my hand, the way I do when using it. I did a little ambidextrous drawing with a pencil, around each of my fingers and also my thumb, so I could make sure when I removed material, it would fit my hand. Turned out to be a great decision. 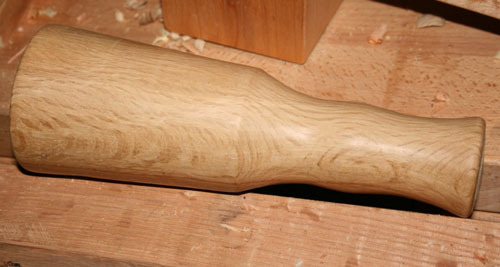 More recently I turned some old oak into a nice smallish mallet. The piece of wood was fairly short, so it didn’t lend itself to making the handle portion as long as I’d have liked to fit my hand. Again, I decided there was some modifications I could do to ultimately make the mallet more user friendly. This time I decided I’d carve a notch where my thumb will sit, to make it more comfortable and hopefully more usable. I snapped a picture of the mallet from it’s opposite side, to show what it looked like prior to “surgery”. I started off by holding the mallet a couple of different ways to find what felt the best. After I was sure of my decision, I again drew in pencil around the location of my thumb, while I was holding the mallet. I used a couple of carving gouges, a #7 20mm and a #9 20mm. I was able to hold the mallet securely with a hand screw, and held the hand screw in my bench vise. I used my #9 gouge starting in the center of my marked area and making sure to work the correct direction for the grain of the wood. I didn’t want to pop off any chunks outside of my intended area. I used my old square mallet to drive the gouge, especially at the beginning since I was working in Oak, which is fairly tough. After I had a fair amount roughed out, I moved over to my #7. For me, this gave me a little more control as it didn’t take as big of a bite with each strike. 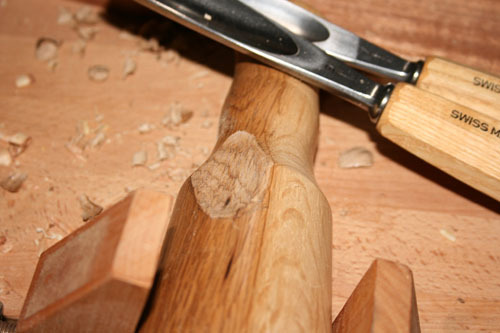 After I had the shape I liked, I then stopped using the mallet and used the gouges more like paring chisels. I was able to take light cuts to smooth out the area where my thumb will ride on the mallet. 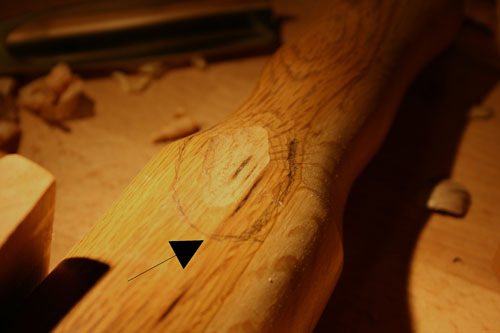 After all of that area was feeling good, I used the #7 very lightly again, on the edges of the carved section. I blended this section with the surrounding areas totally with the gouges. I didn’t use any sand paper, and the thumb recess feels great. 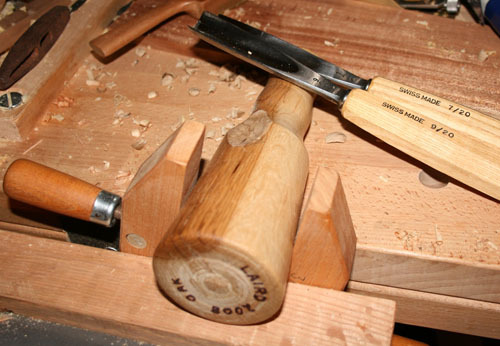 The key to using these tools is exactly the same as using regular chisels or hand planes. Sharp tools are much more predictable and because of this are also much more safe to use. Remember, even though the two mallets I modified were some that I made, you can still modify those that you buy. Ultimately it’s all about making your woodworking experience better. Until next time, keep woodworking.